At its best, the 3DS eShop is host to titles with a simple, well-formed idea that's executed with care and skill. 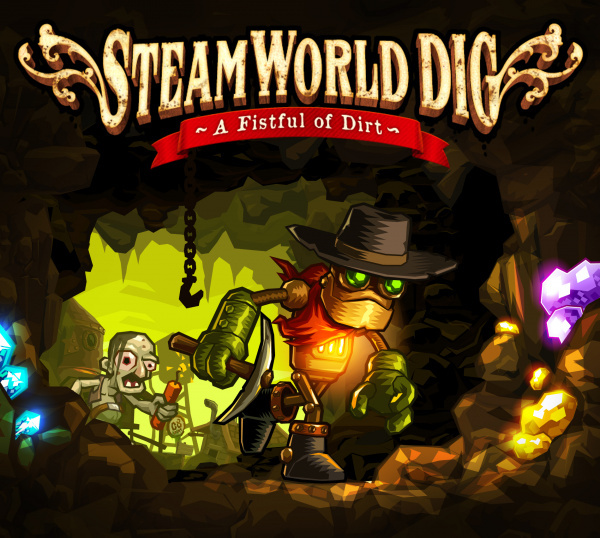 SteamWorld Dig, the second in the SteamWorld franchise from developer Image & Form, fits into that mould, incorporating puzzle platforming mechanics within a continuous process of digging and resource management. It's also a particularly challenging proposition, which is well-suited to experienced gamers while a stiff — but not impossible — challenge for others. SteamWorld Dig opens with our hero, Rusty the steambot, walking towards the town of Tumbleton to inherit a mine left by his Uncle. After a short cutscene you're underground, meeting the first of the townfolk and picking up the first of a number of useful tools, a pickaxe. The early imagery sets the tone for a quality overall experience, a colourful but dusty steampunk world where bots rule the roost, and the presence of humans is part of robot mythology. The storyline, though fairly minimalistic, fits the setting perfectly. This is the beginning of a solid, steady progression in new tools and abilities that transform you from an incapable newcomer into a multi-functional mining machine. Progression through the storyline — around four hours if tackled fairly quickly — is a relatively linear affair if prompts are keenly followed, but there are opportunities to explore every inch of the three primary mining sites. These three sites each have their own style, even if in theory they actually represent one continuous mine going deeper into the earth; initially, basic tools serve their purpose as you dig and explore. What's important to know, and something that prompted us to restart after a sloppy opening 45 minutes of recklessly digging our way into traps, is that every move you make, every block of dirt removed, is a permanent change, necessitating due care in constructing pathways downwards. 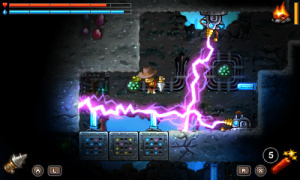 Early on you can wall-jump and have a limited-use "steam jump", but it's possible to leave an unreachable gap to jump back up, meaning an auto-destruct is needed to return to the surface. Those mistakes are learnt from and it becomes natural to pick a path through the mine that can be re-traversed to the surface, while also digging up valuable ores and metals along the way. While greater direction and map tools emerge towards the end-game, the perceived linearity is still restricted to a red arrow telling you to go downwards, with much of the route determined by your own curiosity. 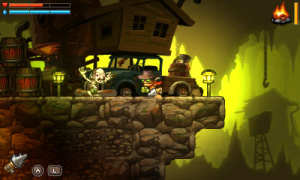 It's not just a simple move from checkpoint A to B, either, as characters in Tumbleton convert your findings to gold, which levels up your character and makes certain items available. 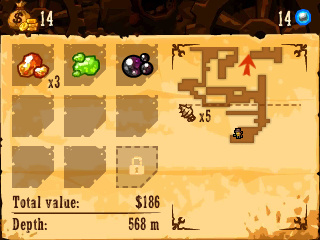 With a combination of gold and special ore that you discover, you level up features such as your health meter, water storage — for various steam-based moves — as well as various digging tools/ weapons. Although your primary role is to mine goods, mixing resource accumulation with digging further down, you gradually encounter enemies. Your move set and tools become twofold as means of exploration and weapons, and early on the going can be tough. Charging through the environment gung-ho can lead to death, which strips you of half your gold, while any metals you were carrying are left behind in a bag where you fell; they can be retrieved, however, so all is not lost. Enemies and environments become increasingly challenging to tackle as you progress, and neglecting to upgrade tools and capabilities can be costly. Developer Image & Form made a point, ahead of release, to describe this as a game for experienced, capable gamers and that seems to be completely accurate; the diligence and skill required may prove too much for some. That's not a criticism in itself, far from it, but the absence of an Easy difficulty is perhaps a missed opportunity — nevertheless, this delivers a challenge to engage gamer's minds, in particular, with some sharp reflexes and inquisitive natures needed. For the duration this is a title that hits a sweet spot of freedom, subtle direction and intuitive leveling up. By the conclusion you have a broad range of abilities that make previously tricky areas a doddle, but the first two-thirds to three-quarters test your patience and focus, with one misstep potentially costing you funds and necessitating tricky backtracking. At all times it feels like fair difficulty, however, with problems almost always traceable to your own mistake; it's vital to carefully manage a route back to the surface or checkpoints, as well as race to return before your light dims — various elements drive the tempo. For all of its purity of purpose, this is a title that goes to pains to avoid any complications or flexibility. As well as the aforementioned lack of difficulty settings, finishing the game gives you grades based on time to complete, money earned and number of orbs recovered. Reloading the save leaves you with the mine sites without any storyline checkpoints, so it's possible to work through picking up any left over parts; perfectionists can, of course, use another of the three save profiles to play again, seeking top marks. Yet the pleasure with this experience is with exploration and discovery of the underlying plot, so after an initial play-through some may be satisfied, meaning that the developer's cited playtime of over 10 hours is really restricted to a specific demographic, rather than all players. Overall, however, the campaign itself is worth the price, as it's structured and formed to hook gamers each step of the way; it hits its mark. 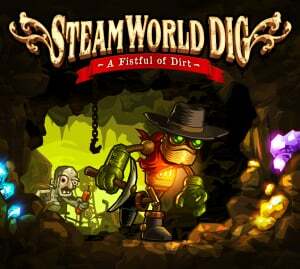 SteamWorld Dig represents a strong coming together of concept and execution, with relatively simple mechanics impeccably layered to coax the gamer through its story. It's demanding and perhaps too punishing for some, but the mix of basic platforming, puzzling and action works well, with a beautifully balanced leveling system underpinning the whole undertaking. Beyond the initial thrill of exploration it's questionable whether much else can draw you back, but this is a game that achieves its goals with some panache and plenty of style. If a challenge and thinking-person's platformer appeals to you, this one should be added to your 3DS collection right away. I'll buy it as soon as its discounted, but i don't want to spend my money to ensure i can buy pokemon y on release. I'm glad it's getting so much praise. Now I can download it knowing it is worth it. I was on the fence whether to buy this one or not but I'm convinced now. Downloading it in a few minutes. Without a doubt my next e-shop purchase. Was going to wait to get this for this review but I heard too many good things about it and also think the devs deserve to be rewarded with the full price purchase. Sometimes I wait for sales but not in this case. I saw it wednesday and was immediately sold on the concept. Wow...just wow. And they are making a sequel for 3DS!! 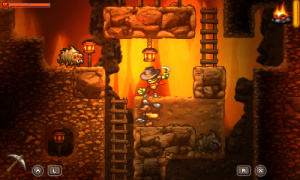 I will have to wait till I can get another eshop card again then I will download SteamWorld Dig. It's a really fun and addictive game, I highly recommend it! This game looks pretty neat so I'll probably end up purchasing it at some point. It's just too bad that this game doesn't have much replay value. Still, I am confident that the game play is entertaining enough to warrant the purchase. GREAT REVIEW AND GREAT GAME! I bought this game day of release and I'd probably give it a 7.5 - 8.0. It's a definitely a fun game with a perfect blend of difficulty. My first playthrough took 6 hours, doing a speed run now. It reminds me of a mix between Metroid and Terraria (the mining aspect). One thing I found disappointing was a lack of bosses.. but that really shouldn't take away from the game itself. It was great and there were actually some levels that took a while to figure out. Oh look out if gamespots Carolyn reviews this it will score a 5 out of 10. It will be far to hard for her lol just like the 6 she gave luigis mansion. Bought it. One of my most satisfying eShop purchases. The game deserves to be supported with a speedy purchase! Looking forward to the next one I&F!! Talent! You did not use "We need to go deeper" as the headline. Missed opportunity. But still, great review guys. I was going to probably DL this anyway, but this makes my decision even easier. Kind of want to finish as many things in Bike Rider DX, than I will get this game. I love having good quality indie games to support. Great! I will definitely be picking this up. Good review. i don't mind a short-ish game (given my huge backlog). Was very interested after viewing the trailer. Will d/l later today. @imageform You guys deserve 100 champagne filled hot tubs! One of the most addictive games I've played in a long time. Thank you for this amazing game and making a sequel to it. I am bugging everyone I know to buy and play it. Its definitely worth its price. Seriously, i got it the second it was released and have played it ever since, only taking time to visit my animal crossing town to get the daily stuff sorted, then right back to digging and exploring the depths of this fantastic game! @imageform Great work, I will be keeping my eyes on your future endeavours. You got yourselves a fan! I am very intrigued by the video and comments. Definitely putting this on my Wish List. I may purchase, but not right away. 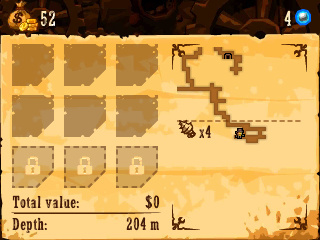 How similar is it to "Dig It" on iOS and other similar digging games that have been out for years? No review or preview of this game ever seems to acknowledge any of them. I have the game and it's great! I don't know about this. (I normally avoid things listed as "Puzzle Platformers"). I think there is no point in games where it tells what to do. "if prompts are keenly followed". I wish there was a site where I agreed with the majority of the reviews then I could just buy from the scores more easily seems like all the sites review things the same these days. The average score on this site according to Metacritic is 70% so it is one point better than average. Be much better if they reset the scores to be 50% or less as average. In my non-existent review I said it was the greatest thing mankind can control with hands. Can I come?! I might get it when it goes on sale. Not a word about the music and sound effects? Almost none about the graphics... I'm sorry but this is not a good review and is far from being one of your best. It feels rushed. @WinterWarm Of course - always room for one more bottom in the Champagne Hot Tub! Everyone, reach out to everyone you know, and we'll have a sequel. The music sounds like it was done by the guy who did the music in the Metroid Prime Trilogy. Was it? @Stargazer I don't think so; the music in SteamWorld Dig was written by the excellent Mattias Hammarin (in-game music) and Jonas Kjellberg (main theme). @DarkCoolEdge While I'm name-dropping: although he didn't produce everything alone, the graphics are the brainchildren of our amazing art director Tobias Nilsson. He is also the reason why our magnificent iOS hit Anthill (4.89 out of 5 from >30K user reviews) looks so good. Will do! Great job to everyone at ImageForm! @imageform If ever I'm in Sweden, I'll certainly check the SteamWorld Dig Celebrity Rave Review Champagne Hot Tub out, though I was happy enough just reviewing the game. It's always nice to see eShop games get widespread support, and if I like a game lots and plenty of others agree, that's always a relief! Finished this the other night, it was incredibly addictive and makes you want to play through again to try and speed run. I made the same mistakes that the reviewer did by carelessly digging and not realising how much of an impact it would make permanently. Wow. The graphics seem amazing, great review Do the rest of you who have played this title agree with the 8/10? Just might get this. I REALLY WANT THIS!!! Isn't it like 9$? And is it worth it? @Hairmanban19 Yes it is. Just take the plunge, you won't regret it. I will get this. As to when, it'll either be now or on the 29th when Wario Land 3 is released. @imageform The trailer music sounded like "Ecstasy of Gold" from the Good, the Bad, and the Ugly. Was that on purpose? Because I really like the song you did for the trailer. @Hairmanban19 Glad you did! I still can't believe how this gem came out of nowhere. It is the perfect combo of features I love in games. I am @ImageForm so grateful. @Fast_45er Well, both SteamWorld Dig and "The good, the bad & the ugly" are in a Western setting. I think you'll find a lot of similarities when digging through movie/game titles that go Western. But it's interesting, we've heard about "Ecstasy of Gold" specifically a couple of times now. And obviously Morricone is an inspiration when you want to create desolate-feeling Western themes, and IMO we're not bordering on stealing... Early on I also wanted a bit of Ry Cooder's "Paris, Texas" ambience in there - a brilliant soundscape - but we decided to go more towards spaghetti. @imageform yeah,i'm recommending it to a lot of people,you guys deserve the money for making such a good game! Thanks for all the kind words! You are all hereby bona-fide ImageFormers! @imageform No, I wasn't implying that you were stealing. I've been playing it for a couple of days now, and I gotta say I love it! Thanks for bringing it to the 3DS! I'm a big fan of the Spaghetti Western style, especially since I've watched the Dollars Trilogy recently. I love that title screen song and the desolate, atmospheric songs that play underground! I hope to see you bring more games like this to 3DS in the future! Buying this today! After all this praise, and now a slight discount, I can't say no. Game looks awesome! Should I get it at discount? @imageform Bought this on discount and - I am so glad that I give you my money - what a great game! Cheers and thanks for the great game! @njechranjec Glad to hear you enjoyed it so much! We just love to hear stories like yours. Some people are hesitant, not knowing if the game is for them, and then they decide to try it out - and instantly fall in love! So in essence: everyone should try out SteamWorld Dig, because the game is for everyone. Wasn't sure about getting this cause there were no bosses, but I'm glad I took a shot. This may beat out Mario 3D Land for most I've enjoyed a game on 3DS. The gameplay is perfect. @ThomasBW84 Wow; finishing the main campaign in 4 hours sounds like a nigh-superhuman feat of gaming, Mr. Whitehead. How much longer do you think you would have used if you hadn't restarted after the first 45 mins? My own time of 10 and a half isn't anywhere near impressive, though my playing style is very ponderous and exploring (I hate missing out on secrets and stuff). I got gold stars for equipment and money, silver for deaths (nine) and bronze for playing time (obviously). I enjoyed the rather minimal amount of handholding, aside from the arrow pointing toward the next objective, along with the subtle ways in which the equipment upgrades transformed the gameplay at regular intervals. @imageworks I'll be eagerly awaiting the sequel, along with the next Steamworld title! I'd been hearing good things (and I saw my roommate playing it) so I grabbed this on sale Its actually cheaper than on Steam after their PC release! I think I'd prefer the 3DS interface anyway and the portability. Everyone should grab it and have no regrets! I think its one of my best holiday sale game purchases. Its an awesome game, you guys need to make a sequel; go deeper, more upgrades and more loot! Got this today! It's great! an 8 out of 10?? Not sure how anyone in their right mind can score this game which deserves a perfect 10 out of 10!!!!!!!! I have been gaming for decades and this game is utterly brilliant on every single level!!! This is on my top 25 games of all time... yes, it's THAT f'ing great!!!!!!!!!!!! Just got it, it's addicting!